ADATA is a known name in the memory and storage segment of the PC components business. Recently the company released the XPG SX930 series of SSDs which will replace the SX900 series. XPG stands for Xtreme Performance Gear and this series is addressed at the gamer and overclocker crowd. This series comes in three storage variants: 120GB, 240GB and 480GB. We tested the 240GB variant and here are our observations. The ADATA XPG SX930 comes in a metallic body with a black brush metal finish and has a 7mm z-height form factor. The box comes with a 2.5-inch to 3.5-inch desktop adapter as well as a laptop SSD spacer giving you the option to slot the SSD in either configurations. It comes with a 5-year warranty period. Opening up the SSD reveals a half-height PCB board which has four 16nm Micron 128Gbit synchronous MLC plus NAND chips on either side. The SSD controller is present on the other side of the PCB than the one facing you as you open the SSD. It comes with a SATA 6 Gbps interface. ADATA has employed the JMicron JMF670H controller, which is a 4-channel controller with a single 32-bit ARM 968 processor. Below the JMicron controller, you have the Nanya 256MB DDR3 SDRAM. Thanks to the use of JMicron controller, you also get a pseudo-SLC (pSLC) acceleration layer called the Write Booster, which is around 8GB for the 240GB drive. One of the limitations of this controller is that it can only support up to 512GB capacity SSDs. The total capacity available to the user with the SX930 240GB SSD is 223GB. ADATA claims that you can extract up to 3,000 program / erase cycles with its NAND. You also get access to ADATA’s SSD Toolbox and you can download the Acronis True Image utility to clone your existing hard drive with your OS and data on to the SSD. This is the most popular storage benchmarking tool and allows you to check read and write speeds across various transfer sizes and queue depths. ATTO is also a good tool to check for the marketing spiel of SSD makers where they publish sequential read and write speeds on the packaging. The ATTO benchmarks are in line with the stated sequential speeds of the ADATA XPG SX930, only the sequential read speed is off by 10MB/s, but that’s not a huge margin. The sequential write speed crosses the 460MB/s mark. AS SSD is a benchmark tool built specifically for SSDs which uses incompressible data and calculates sequential and random read and write speeds and gives an overall score at the end. It also gives you the input/output operations per second or IOPS for each of those tests which is interesting. Apart from this you can also perform Copy Test where it creates test folders for large files simulating ISO, programs and games and measures the transfer speeds and duration. AS SSD tests shows that the ADATA SX930 SSD is definitely slower than its peers, although not by huge margin. The 4K random write test is at par with Samsung 840 Pro as well as Corsair Neutron GTX SSDs and this could be attributed to the pSLC acceleration layer. ADATA hasn’t claimed any IOPS count number as we see with most SSDs, and it seems evident from the numbers the reason behind it. PC Mark 7 is a complete PC benchmarking solution for Windows 7 having a dedicated Storage test module. It is a collection of workloads that isolate the performance of your PC’s SSD. The Secondary Storage test allows you to test drives other than your system drive. It simulates operations such as importing pictures, gaming, starting applications and so on. Anvil Storage utilities is another versatile SSD benchmark tool which besides having an in-built SSD tool, also allows you the option to tweak the settings. Just like the AS SSD benchmark, you get a read, write and an overall score. The tables are more in-depth as it gives you response time, IOPS, MB read/written and finally the transfer speeds in MB/s. You can perform threaded I/O read and write tests where you can adjust block size as well as the queue depth. We ran the SSD test using 100 per cent incompressible and 46 per cent compression. 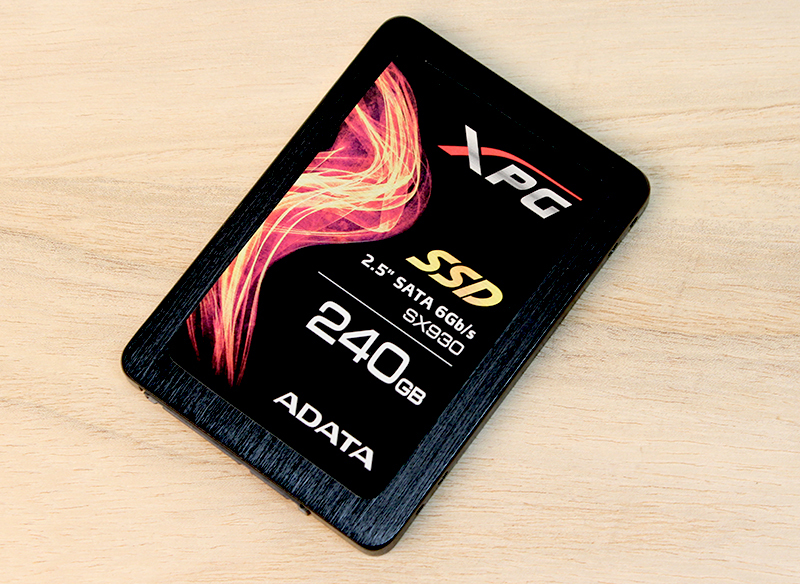 The ADATA XPG SX930 240GB SSD gives a decent performance. There was nothing that stood out from what we have seen in the past. The IOPS was one of the lowest we have seen in recent times. However, the drive comes at an MRP of Rs 11,500 but it has a market operating price of Rs 8,050 which gives around Rs 36.09 per GB. It is around Rs 1500 lower than the better performing Kingston HyperX Savage SSD. If you can spend that much, we would recommend the Kingston SSD. Else the SX930 SSD with its 5-year warranty is a good drive to consider in your mid-range and gaming builds.